Double review today! To save you all fromdroning, I’ll have more concise thoughts instead of full recaps. As for the wrestling, AAW is developing some storylines through the first three episodes, so let’s see how that continues in these two. Colvin and St. Holmes start us off with a little intro to tonight’s action. They kick it out to the opener. Looks like we’ve got AAW TV’s first ever ladies’ match to start. “Miss Natural” Heather Patera vs. “The Punk Rock Rag Doll” Heidi Lovelace: These two have a long-lasting feud in AAW, so long that this match, taped almost a year ago, already was part of an old rivalry. Patera’s twice the size of the diminutive Lovelace. Heidi is all energy; Patera is a powerhouse. Lovelace bumps like crazy for Patera and it looks great. Patera serves as a solid base for Lovelace to work off of too. These two have solid chemistry. “Dirty” Dan Lawrence vs. Colt “Boom Boom” Cabana: It’s a match between one wrestler who makes his opponents look like clowns and another wrestler who always looks like a clown. Lawrence has this great way of screwing up when he should succeed and pulling through when he should fail. Cabana is a total enabler. Stars can’t adequately rate this match. 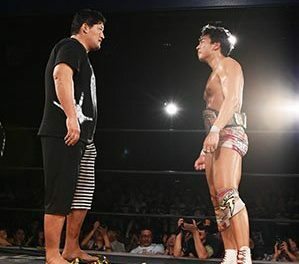 It’s not a technical wrestling showcase or something like that, but these two were made for each other. Superbly enjoyable and I’ve watched it three times in the past week. Barely a match for Colon here. He got the W, but that’s not enough for him, so Colon cuts a short promo after. Alex Colon vs. Silas Young: Silas Young comes out and grabs a mic to challenge Colon. Young is there to represent the very special AAW fans. Young and Colon open with chain wrestling. Neither is able to get a real edge, even with the major size difference. Young gets to show that size difference, and the power that comes with it, while Colon is keen on making things dirty. This one’s a real sprint of a main event. Colon and Young work at a blistering rate. There’s not a lot of selling or building off of work in the match, two things that up a rating in my book, but I can see a lot of people giving this more love than I do. It’s a good piece to build up Young. Silas Young gets up close with the camera somewhere backstage as episode 5 starts. He’s looking for revenge and can’t wait to beat Eddie Kingston’s face in. Colvin and St. Holmes gives us our obligatory opening. Today’s matches come from outside the Berwyn Eagles Club for the first time. Instead, we go down to Bourbon Street. AAW Heavyweight Championship – “Sugar” Shane Hollister (c) (/w Marcus Crane & Scarlett Bordeaux) vs. Flip Kendrick: AAW announces Hollister at 180 pounds. This is probably my personal fascination, but announced weights catch my interest. Hollister’s is probably accurate. Kendrick is even smaller. Hollister uses that size advantage to push Kendrick into the corner at the start. Hollister can bully Kendrick around when he grabs a hold of him. Kendrick avoids letting that happen at all costs as he flies around the ring, into the ring, out of the ring, wherever he can. Hollister relishes in hurting Kendrick, like when he gets him in a seated stretch and starts to grind his thumb into Kendrick’s ribs. He lays the boots into him after that, then tries a Jericho pin for good measure. Hollister looks great when he controls the match and that’s when things flow best. Kendrick can do some impressive flying, but he got too much in for my liking. Hollister flipped between looking like a dominant champ and a guy who was vulnerable, but not in a good way. Eddie Kingston responds to Silas Young. This won’t be the last we see of him either. Kingston is in the main event today against Rhino, who gets some camera time of his own. Eddie Kingston vs. “The War Machine” Rhino: Kingston hurls a chair at Rhino from outside the ring before the match starts. Not content with having one opponent tonight, Kingston decides to get into it with the fans too. The match starts out with a bit of wrestling. Can’t say that I expected that. With these two, I was thinking we would have a pure brawl on our hands. One stiff chop too many kills that. Let the punches fly! Kngston and Rhino trade hard chops outside the ring. Kingston parts the crowd to throw Rhino into the sea of chairs, PWG style, only for Rhino to turn the tables. The brawl goes into the crowd for a while until returning to the ring. They trade bombs back and forth as momentum trades between the two. Kingston lands a hard discus elbow then an exploder, but Rhino kicks out at two. Rhino’s toughness gets the best of Kingston, who digs some chairs out from under the ring. He sets two up, facing each other then lays a third on top. Kingston starts climbing the ropes when Rhino cuts him off. Rhino grabs Kingston and powerbombs him through the chairs. That’s a two count too. There are things to like here. Both are adept at brawling and those segments of the match go well. Rhino gets put over huge here even in a loss. He ate so much punishment. The real problem is that things went too long. Going five minutes less would have helped a ton. Kingston cuts another promo that night after his match. Super intense. Two very different shows. The first one had four matches, three of substance, all of which went by in a flash. All three were smooth and enjoyable in their own ways. That was probably AAW TV’s best episode yet. Episode 5, on the other hand, had two matches, both of which were significantly longer than anything on Episode 4. Both could stand to trim some fat from the matches. Not a great hour of TV, but the Kingston-Silas Young feud keeps building, so it’s worth watching.